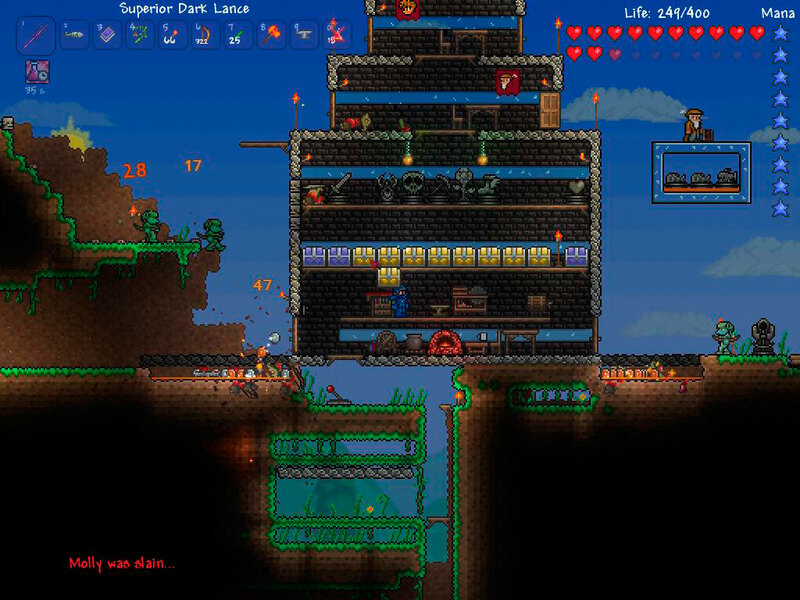 Up until I started playing a few weeks ago, the entire mental space Terraria occupied for me can be summed up as “that 2D Minecraft knock-off.” I am not even sure which game came first, and it did not seem to matter: Terraria was just another game about digging for ore and crafting better pickaxes to mine for more ore. In only two dimensions. 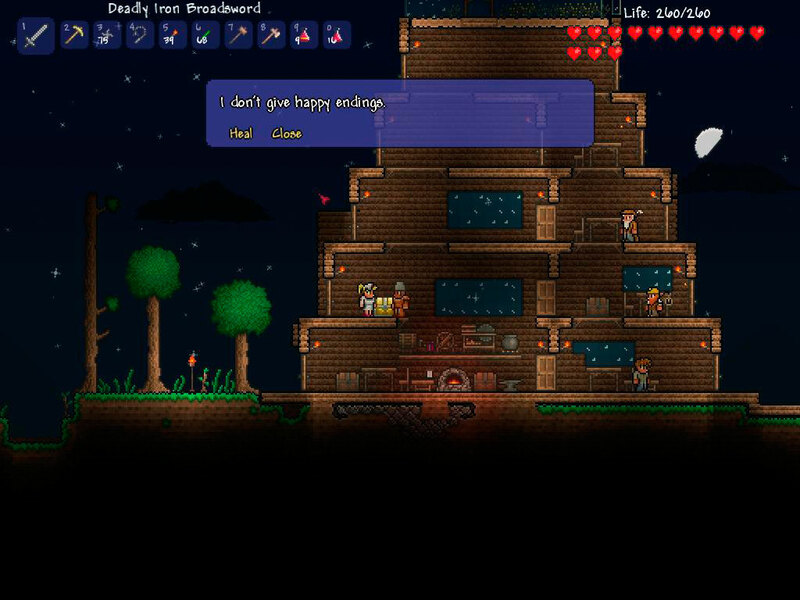 After seeing an entire weekend evaporate in a flurry of clicking pixel blocks however, I am here to say that Terraria is not just a 2D Minecraft clone. It is an unholy union between all the addictive parts of Minecraft combined with legitimately entertaining Metrovania gameplay with a liberal dose of SNES graphical/musical nostalgia thrown into the mix. 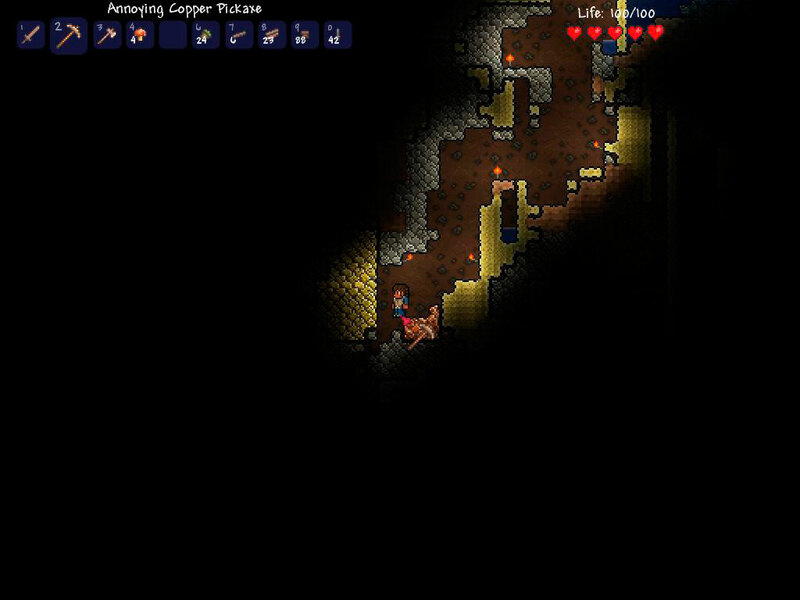 Terraria starts out innocently enough, with your character equipped with a copper sword, axe, and mining pick. The beginning hours will be spent chopping trees, building your first crafting station, killing some slimes to turn their quivering innards into fuel for your torches, and so on. Much like Minecraft, zombies and other uglies come out at night which drives you to create shelter and then start digging underground for wont of something else to do. C’mon, this is easily more explainable than average Minecraft shenanigans. 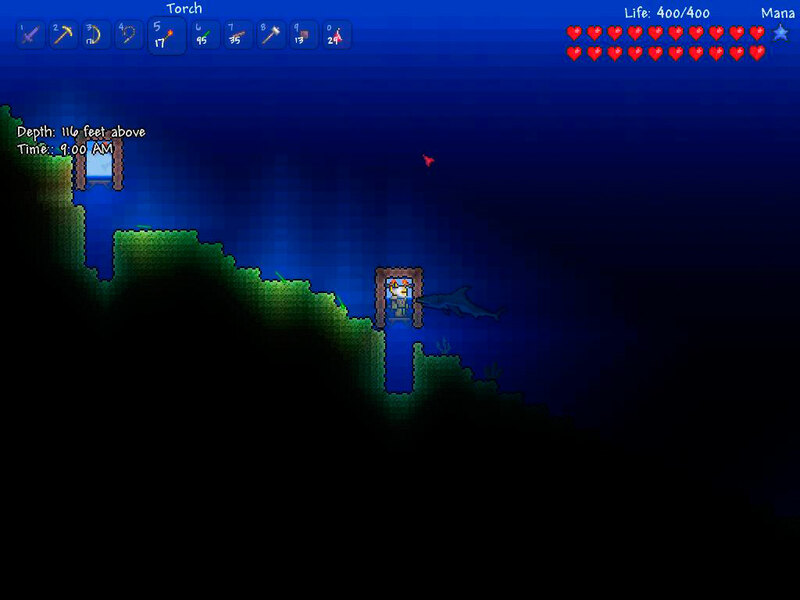 While it might not initially seem so at first, there is a surprising amount of depth (har har) to Terraria’s gameplay. While you are hunting around for Copper and Iron ore, you will of course encounter enemies in the deep places of the earth. You will also frequently encounter priceless clay pots of a forgotten age which can be broken and looted for coins. You will eventually start coming across chests filled with goodies/equipment, and even crystalline Hearts, which can be broken and then consumed to increase your HP. As you hit certain milestones, the world around you changes. Once you have accumulated 50 silver pieces, a Merchant will hang around your house, provided you build a room for him to sleep in. Finding and hoarding bombs will cause the Demolitionist to start peddling his explosive warez. And once you surpass 200 HP, there is an increasing chance the Eye of Cthulhu (the first boss) will settle its gaze upon your growing hamlet. Not only does all this progression feel natural, it is also addicting. Your hunt for better ores to craft better armor and weapons to make your life easier leads to encountering stronger foes and ever more secrets. While crafting is a lot less complex than with Minecraft – you can talk to the Guide to see every craftable item that a given ingredient can produce – it simultaneously feels a bit deeper. Hitting Diamond could be accomplished relatively quickly in Minecraft, at which point you were essentially in the endgame. Contrast that with Terraria, where the natural hardiness of your foes directs your exploration of the whole of the game map before culminating in a Final Boss… whose defeat unlocks the Hardmode version of your world, with new enemies and even harder bosses. I… I’ll see myself out. Of course, all of this implicit progression leads to a necessarily more finite resolution. While there are quite a few different set pieces to play around with, you are probably not going to spend the same amount of time building castles and mountain fortresses here as you would in Minecraft. That said, my game clock read 53 hours by the time I finished off the last of the Hardmode bosses and crafted the final piece of my ultimate armor. I could farm these bosses a few more times for their exclusive material drops – who wouldn’t want to run around with a flamethrower? – but it almost seems superfluous at this point. What would be next? Would I reroll a new character in a new procedurally-generated world? I could. But I feel I have already mastered these mechanics, and would simply arrive at the same destination a bit faster this time around. Hell, I could even equip my new character with the flamethrower and best pickaxe in the game to further speed along the process. Or I could go play something else. Overall, the only real regret I have with Terraria was having spent all the time up to this point thinking of it as just a 2D Minecraft. Both games share many similar qualities, but why would another instance of “cause one to lose all track of time” or “become obsessed with mining better ore” be considered a deficiency? Both games are fun, in slightly different ways. Indeed, I am not even sure which one I would recommend first to someone who has played neither. Show Minecraft first, and like me, you might be a tad disappointed in the more limited forms of customization and Terraria not quite comparing to the sheer scale of an infinite 3D world. With Terraria going first though, you run the risk of having the person balk at Minecraft’s lack of direction and flat sense of progression. Yes, that’s a lava moat below a lever-operated trapdoor. In any case, having indie game companies force these tough choices on us when the AAA industry is falling over themselves pumping out derivative, 6-hour long sequels is ultimately a good problem to have. Posted on May 26, 2013, in Review and tagged 2D, Indie, Metrovania, Minecraft, procedurally-generated, random, Terraria. Bookmark the permalink. 2 Comments. Fantastic game. I spent a good 60 hours or so on it over one binge weekend. It’s sad that eventually your progression runs out and there’s not a lot left to do, but it’s a great ride while it lasts. Not sure if you’re keeping up with Terraria’s spiritual successor Starbound (http://playstarbound.com), but it’s headed into beta fairly soon (hopefully) and the premise is basically Terraria on steroids. In space. Yeah. Get excited. Binge holiday weekend, I should say.